Ensure eyeshadow stays put with the Bourjois Eye Primer; an essential base before the application of eyeshadow. Gliding onto the lid assisted by the integrated wand applicator, the transparent formula offers an invisible, undetectable finish that smooths and prepares for makeup. 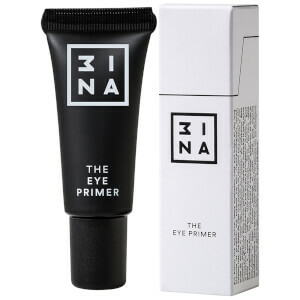 Enhanced with oil gel technology, waxes and polymers, the primer improves the application of shadows, as well as increasing their longevity to guarantee flawless hold for up to 24 hours. The waterproof formula allows for a professional looking application of makeup, ensuring it remains crease, fade and flake-free all day. Copernicia Cerifera Cera/Copernicia, Cerifera (Carnauba) Wax/Cire De Carnauba, Polyethylene, Glyceryl Rosinate, Paraffin, Polyglyceryl-3 Diisostearate, Phenoxyethanol, Aminomethyl Propanediol, Propylene Carbonate, Butylene Glycol, Triethoxycaprylylsilane, Synthetic Wax, Sorbitol, [May Contain/Peut Contenir/+/-: Titanium Dioxide (Ci 77891), Iron Oxides (Ci 77491, Ci 77492, Ci 77499)].